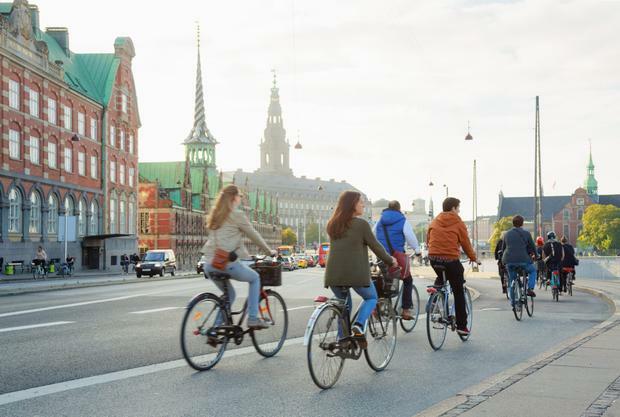 Copenhagen - the home of the little ­mermaid - is the urban cyclist's paradise and a beacon to other cities around the world of how the bike, the car and the pedestrian can happily co-exist. But it wasn't always this way. Car ownership swelled in the 1960s and areas of the city, now well-known as open and bike-friendly communal spaces, were choked with traffic. Accidents involving cyclists began to rise and many cyclists lost their lives. By the 1970s and 80s, residents of the Danish capital had enough and there was an enormous public outcry to re-instate the city's public spaces and to protect cyclists. One form of protest was the act of painting white crosses on the asphalt where cyclists had been killed across the city. City planning that gave space to cars, bicycles, pedestrians and public transport became the solution. Copenhagen was one of the first cities in Europe to grasp the nettle in the early 1960s and began reducing car traffic and parking in the city centre. Out of this realisation grew the Danish model with its extended network of cycle lanes along the roads. Today, 16pc of all trips in Denmark are made by bike, almost a quarter of all journeys under 5km are taken on two wheels and 36pc of all Danish adults ride a bike to work at least once a week. Only 15pc of cyclists actually wear a helmet. Why? Because there the consensus is that the cyclist must not be seen as some victim who is to blame if there's an accident. The responsibility for seeing the cyclist rests with the motorist. And the Danish cycle lane is unique, with an edge to protect cyclist from cars. The standard width of cycle lanes in Denmark is 2.2m which makes side-by-side conversation possible and overtaking can be done safely. Copenhagen's new standard cycle lane width is 2.5 to 2.8m and offers space for three cyclists next to each other.